The Museu Frederic Marès is one of the most important sculpture museums in Spain. Presented is the collection of the sculptor Frederic Marès, during his lifetime from 1893-1991 obsessed collected statues and all sorts of curiosities. The museum has one of the most important collection of Spanish sculptures from the 12th to 19 Century. It is housed the museum Museu Frederic Marès in a former palace of the Inquisition in the district Barri Gòtic, just behind the cathedral. In the basement of the museum can be found mainly sculptures of the 3rd and 4 Century, a collection of crucifixes and statues of the Virgin Mary from the Romance and Gothic and other religious artifacts. 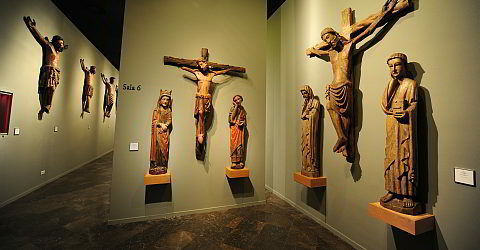 With the beautiful collection of crucifixes image the change of Christ to understand. On the first floor will continue this collection of works from the Baroque and the Renaissance. You'll also find the so-called Museu Sentinel, which objects from the bourgeois life in Barcelona in the last two centuries shows such as Umbrellas, glasses, canes etc.. The room is divided into several areas: the area of women with the typical paraphernalia of the bourgeois woman of the 19th Century, the smoking room with pipes and other paraphernalia of the Lords and the game room, then toys. Tip: For a break invites the Café d'Estiu in the beautiful courtyard. Free entry to the Museu Frederic Marès is obtained with the Barcelona Card. Frederic Marès was born in Portbou in 1893. In 1903 his family moved to Barcelona. He studied at the School of Arts and Offices and at the School of Fine Arts in Barcelona and went abroad several times during his time at the university. Shortly after graduating from university, Marès started working as a university professor and remained in office until he retired in 1964. As a young teacher, Marès worked at the workshop of he sculptor Eusebi Arnau. His first work for the city of Barcelona dates from that period. It was inaugurated in 1919 at the Plaça del Clot. As an unknown artist he mainly produced sculptures for mausoleums. With a series of his sculptures representing naked female bodies, he had found his own style that rates among the second generation of artists of the Modernisme. However, Marès did not continue working with this style but specialized in monumental sculptures. In the 1920s, the city of Barcelona ordered some works from him which can be found in public spaces, among other things in the fountain at Plaça Catalunya and the stairs leading to the Montjüic. After the Spanish Civil War he chiefly dedicated himself to the restoration of destroyed statues and buildings. In his memoirs Marès wrote that in his childhood he had collected little pictures, chocolate papers and Japanese pictures. He was a student when his father was offered a painting from the 15th century showing Ramin Llull that he could not afford. Marès bought it with the prize money he got at an exhibition. During his time in Paris he had connections to antiquarian bookshops and art auctions. Here he started gathering his first collections. Marès family could not support Frederic’s passion for collection as other families of well-known collectors did. He spent all the money he earned for his designs and works for extending his collection. Apart from his close friends and family, nobody knew of the growing collection in his studio. After he had presented his collection to the public with the help of an art club, he declared in his testament in 1944 that after his death he would bequeath his collection to the city of Barcelona. Frederic Marès still lived until 1991. The history of the museum began in 1944, as Frederic Marès established in his will that the city of Barcelona should get his collection after his death. This year, he showed the first time the result of his collecting. He was 51 years old, he died aged 99-years old. In 1946, he had his first rented space for his museum. At the end of 1948 his collection included four rooms in the house on the Carrer dels Comtes de Barcelona. In 1952 the collected works of Frederic Marès filled three floors of the building. Until 1970 the collection grew to its present and final size. In 1999, the museum moved into the present building at the Plaza de Iu. Closed on 1 Jan., 1 May, 24 June and 25 Dec.
Children under 16 years: free. On the 1st Sunday of a month and Sunday evening free. For the museum you should plan about 1.5 hours. On hot days the café in the courtyard invites you to take a break.